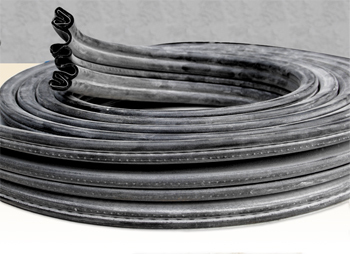 Replace Your Worn Out Camper Boot Seal with your choice of Accordion Boot or Compression Boot Gasket Material. When you are ready to place your order just click on the "ORDER NOW " button. You will be guided though the order procedure. All orders are processed though the web site through Paypal. To order you must use the order form. When you are ready to place your order just click on the "ORDER NOW " button. You will be guided though the order procedure. All orders are processed though the website through Paypal. To order you must use the order form. To start, choose a shipping destination. Check your entries, then click on the "Order Now" button. Use this seal when you leave the rear slider window in the truck. This product works best with fiberglass shells that are 1/8" to 3/16" thick. You will also use this boot if the opening in the fiberglass shell is much larger than the opening in your truck. The extra wide accordion boot is designed applications where you have a large gap between the space you want to seal. This product works best with fiberglass shells or sheet metal flange that are 1/8" to 3/16" thick. Both openings must be exactly the same size for this boot to fit properly. The Ultra Wide 10 Inch accordion boot is designed for very wide gaps between cabs.. This product works best with fiberglass shells that are 1/8" to 3/16" thick. Please note that both openings must be exactly the same size for this boot to fit properly.